Power outages and disasters are unpredictable occurrences and should they strike, separately or at the same time, you’ll be left without electricity for an unknown period during which your essential home electrical appliances shall have ground to a halt. Outdoor enthusiasts like campers, tailgate party lovers, and even contractors also need a secondary source of electricity when they are no longer connected to the national grid. In these situations, a portable generator becomes a very indispensable tool. Their preference among these groups of people is informed by the fact that they are, among other things, very efficient in their consumption of gasoline, are capable of running continuously for anywhere between 4 and 20 hours, and lightweight and compact and therefore portable to be used almost anywhere. The search for the best, or rather the most suitable portable generator is understandably a time-consuming, laborious endeavor that borders on nerve-wracking. The market is flooded with numerous models, each optimized for different circumstances and with different power outputs. On your search for the most suitable one, make a point of settling for nothing less than a solid and professionally constructed model, one that packs all the essential features and is guaranteed to serve you faithfully for the next several years. Other than supplying you with backup power, a portable generator should also run economically at anywhere around 4000 watts. To help with the selection problem, we’ve put together a list of some of the high-performance portable generators out there. By examining and comparing their qualities, you’ll be able to make an informed decision going forward. Two of the most important factors you need to prioritize when the need for an emergency power arises, either because of the occurrence of a natural disaster or because of an unexpected power outage, are safety and dependability. And the Honda EM6500S w/ Electric Start provides with both. The rugged and robust construction of the portable generator also means it has the ability to withstand regular, day-to-day use and will similarly perform spectacularly when subjected to heavy use. Its versatility and high-performance also mean it can be used efficiently on the job site by contractors as the primary source of power and by families who only need emergency power in case there is a problem with their regular supply. No matter the group where you belong, the safety, reliability, quiet design, and trouble-free operation of the generator makes it one of the best units on the market currently. There are several keynote features that make it particularly suited for providing you with emergency power in case of a calamity, power outage or when you're on an outdoor expedition. To begin with, the machine has a 5,000-watt power rating, which means it's capable of providing you and your family with sufficient power to guarantee the smooth running of essential electronics in case of an emergency. It also boasts a surge rating of 7,000-watts, which is the maximum power load it's capable of handling for approximately 10 seconds. In addition to its impressive power rating, the Honda EM6500S is fitted with a 6.2-gallon gas tank. While the tank is just a fraction of some of the tanks on other portable generators out there, it works quietly and efficiently when paired with the machine's 389-cc engine. In case all your appliances use just half of the maximum wattage, you should expect to use the generator for up to 10.4-hours, one of the longest run times for a vast majority of portable generators we evaluated. As for ease of use, you'll be pleased to learn that it comes with both an electric ignition and a pull ignition. The latter makes starting the unit easy, trouble-free and a straightforward endeavor as all you have to do is push a button. The button takes the effort from starting your portable generator since it eliminates the need pull a recoil rope like someone attempting to bring an old, rickety lawnmower back to life. Because of the feature, there is literally zero risk of straining your body muscles, throwing your back out or injuring your fingers, which makes the Honda EM6500S an ideal choice for individuals looking for smooth and hassle-free operation. Should the battery die, you can readily resort to the pull ignition. Keeping your portable generator in optimal condition or running it once a while will, however, prevent the possibility of the battery dying. One of the main drawbacks to using a portable generator is that the power they generate tends to fluctuate thereby creating power distortions capable of damaging the sensitive circuits inside your electronic equipment. To circumvent the drawback, most generators come equipped with voltage regulators to ensure consistency in voltage. The Honda EM6500S however, sets itself from the stiff competition by featuring an innovative, intelligent automatic voltage regulator (iAVR), which is about 50 percent more efficient in ensuring voltage does not fluctuate or distort as compared to standard AVRs. The iAVR is partly why the Honda EM6500S Generator w/ Electric Start is also more expensive than conventional portable generators. Similar to other top-end portable generators, it comes with useful circuit breakers for preventing a system overload and a low-oil shutdown so that the engine does not get irreparably damaged when the oil levels are running too low. Another of its distinct features is the inclusion of a ground-fault circuit interrupter (GFCI) outlets. The GFCI is responsible for measuring or rather, monitoring the flow of electrical current between the Honda EM6500S and your connected appliances. If it detects that the in-flowing current has diminished vis-à-vis the out-going current, it promptly switches of the power as the disparity could indicate that the current is taking a different path. The GFCI, therefore, makes the Honda EM6500S Generator w/ Electric Start one of the safest and most energy efficient portable generators you come across on the market. In conclusion, the Honda EM6500S packs some very premium features and spots a very sturdy and durable construction which, without a doubt, makes it deserving of the top slot. It additionally boasts of a longer running time compared to standard portable generators, has an easy-to-use electric start ignition, operates quietly, and comes with several features aimed at keeping you safe. The iAVR feature is a handy addition that minimizes damage to your appliances by preventing fluctuations and distortions in voltage. No matter the circumstances under which you’ll be using it, this generator is one of the safest and most dependable portable generators out there. As far as portability goes, the WEN 56352, 3000 Gas Powered Generator is a serious contender for the top spot. For those looking to for outdoor expeditions like camping, or need emergency lighting and power supply in case of power outage or calamity will appreciate the fact that the WEN 56352 is both lightweight and compact. The product has dimensions of 23-inches by 17-inches by 17-inches and weighs just 103.3 pounds. The diminutive design makes it possible to fit the portable generator is any small space, and it won't take up too much storage space in the trunk of your car, for those thinking of transporting it to a camping site. Because it is lightweight, you'll be able to carry it with ease without risking straining your hands and body joints or injuring your hands and fingers, as is the case with most bulky and heavy portable generators out there. The other features that tremendous facilitate portability are the wheel kit and the foldable handles. The former enables you to pull the WEN 56352 through different types of terrains as the wheels are both sturdy and rugged to withstand heavy use. The foldable handles, on the other hand, are ergonomically designed to increase comfort and make transporting a breeze. Correctly using and maintaining the generator is a straightforward and effortless task and one that does not require any experience or any working knowledge on portable generators, meaning that both novices, senior citizens, and even the experienced users will have an easy time using it. Scheduling maintenance or changing oil is made very easy with the inclusion of a digital readout system that will promptly remind you to take any necessary actions for keeping the portable generator in optimal performance condition. And in case the oil level gets too low, you don't have to worry about the possibility of it seizing up. It comes with a low-oil shutdown feature that will quickly switch it off when the level goes beyond a minimum level until after the old oil has been replaced with a new and fresh one, thereby preventing permanent damage. The other equally important safety feature is the overload protection that will see to it that the internal components and circuits are not damaged in case too many appliances are connected to the WEN 56352. It is clearly a high-performance portable generator that will be at home in almost any setting. If you are a contractor looking for a secondary power source during construction or are a family planning on going on an outdoor expedition like camping or just want a secondary source of power in case of a power outage, it will serve you faithfully and reliable throughout its useful life. At 50 percent power load, you can use the portable generator for eleven straight hours before requiring to refill. Also, the machine has the capacity for generating 3500-surge watts and 3000-rated watts, thanks to its 212cc engine. Unlike the previous portable generator, this one equipped with a manual, recoil start which means if you don’t have the upper body strength or a pair of extra hands, getting it up and running is going to take some effort. 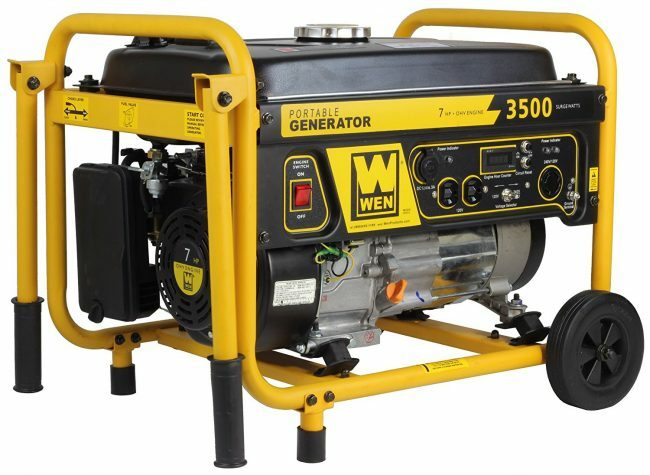 Like already mentioned, the WEN 56352, 3000 Running Watts Gas Powered Portable Generator can run for 11 straight hours at half capacity when its 4-gallon gas tank is full. Consequently, you have more than sufficient amount of power and time to carry out your activities efficiently and with a peace of mind. The machine comes with several power receptacles for plugging in your various electrical equipment. There are 2 120 and one 120/240V twist lock outlets in addition to a 12V direct current outlet for charging batteries and powering any other compatible electrical appliances. Another important consideration before buying a portable generator is the amount of noise it produces when operating optimally. This is particularly important if you don’t want to be held in contempt of noise level regulations found in most campsites. At 23 decibels, it is a little noisy but not to the extent that is going to attract the attention of law enforcement authorities or disadvantage others campers near you, and neither will you have to wear earplugs to protect the sensitivity of your ears. And the best part is it comes with a sufficiently extended 24-month limited warranty to give you a peace of mind knowing all defects resulting from shoddy workmanship or the manufacturer's use of substandard materials will be rectified at no additional charge to you. Overall, the WEN 56352 provides you with a level of reliability and high-performance that are mostly lacking in other portable generators. The unit is both lightweight and compact for greater portability and versatile enough to be used on a wide range of applications such as camping, acting a secondary power source in case of power outage and as the primary power source for contractors. It has an assortment of premium features that increase ease of use and is definitely worth giving serious consideration. Disasters, calamities, emergencies and power outages, by their very nature, are hard to predict and can have severe repercussions if necessary measures are put in place to minimize their effects. Having a backup power source, for instance, can keep important appliances running during an emergency and this can mean the difference between saving and losing a life. To give you peace of mind knowing you have an alternative source of power to resort in case of an emergency, investing in a versatile, high-performance and long-lasting portable generator is of the essence. And one of the best choices on offer on the market today is the DuroMax XP4400E, a product that is genuinely appealing for several reasons. For one, the machine is equipped with a powerful 7-horsepower air-cooled engine that supplies more than adequate power, enough to comfortably run a workplace or campsite, or keep the fridge and lights operating smoothly before power comes back on. The versatility of the DuroMax XP4400E enables you to take it to the busiest job sites and use it to power different power tools that include saws and drills in addition to several other power tools. It runs on unleaded gasoline. The product’s 4-gallon tank will supply you with plenty of power to run your electronic equipment and appliances for eight straight hours provided you keep capacity at 50 percent. For convenience, the portable generator is equipped with an indicator light to notify you whether the starter battery is being charged or not. To prevent irreparable and permanent damage to the internal components of the generator as a result of overloading, the manufacturers thoughtfully incorporated a useful dual 15-amp circuit breaker. Consequently, you can use the portable generator comfortably and with a peace of mind knowing that distortions and fluctuations in power won’t have any devastating repercussions on its performance or longevity. The volt meter is a handy inclusion for tracking output range, and will promptly let you know if there are any disparities. Being a gasoline-powered model, lubrication plays an important role in DuroMax XP4400E and is quite crucial for its optimal performance. According to the user instruction, it is necessary to top up the oil before running it for the first time. 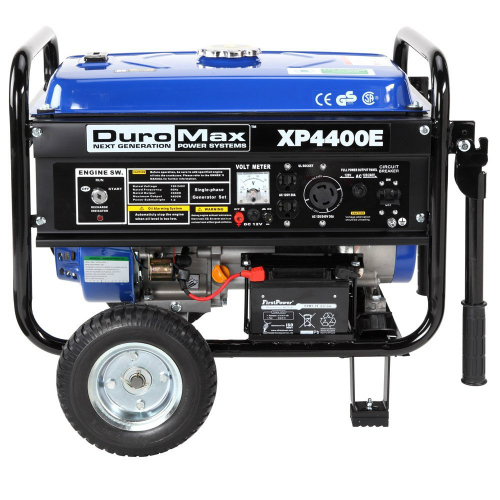 The portable generator has an oil capacity of 20 fluid ounces, and the DuroMax brand highly recommends that you utilize the 10W-30 weight oil. For those living in predominantly hot or cold locations or where temperatures frequently fluctuate between these two conditions, the 5W-30 and SAE-30 come highly recommended for the two regions, respectively. Like all other portable generators in its class, it prevents against the likelihood of jamming or seizing up as a result of operating the unit when the oil levels are lower than ideal. The product comes with a convenient automatic low-oil shut-off feature that will immediately shut it down or prevent it from running when there isn't enough oil. To help you keep track of oil levels, there is an easy-to-see low-oil indicator light that will conveniently go off to alert you on the same. Where the DuroMax XP4400E really shines is in giving you a quiet and peaceful operation with its low noise design. The portable generator is equipped with a large and rather powerful muffler that keeps noise to within comfortable levels, so you don't upset the peace of your fellow outdoor enthusiasts, co-workers or neighbours. Couple the oversized muffler with the factory-installed spark arrestor and you have a machine you can use without earplugs even in confined spaces. Boasting noise levels of 69 decibels at 23 feet, the noise produced by the unit are well within limits allowed by a majority of campgrounds and parks in a majority of countries around the world. As for wattage, it is capable of providing 3500 non-stop operating watts and comes with surges watt rating of 4400-watts. Starting the portable generator is easy as it comes with an electric and recoil start. While the first is as easy as pushing a button, it won't work if you have a dead battery in which you'll be forced to resort to the second option. The only drawback to using the recoil start is that it requires some effort input and might not be ideal for individuals with back problems. Nevertheless, running watts of 3500 is more than adequate for powering your commonly used electric appliances and power tools. One last attractive feature is the 12-month limited warranty, which, while is too brief, is enough to give you a peace of mind knowing you are protected and will be assisted in case something goes wrong. In conclusion, the DuroMax XP4400E is a perfect source of power for individuals looking an alternative. 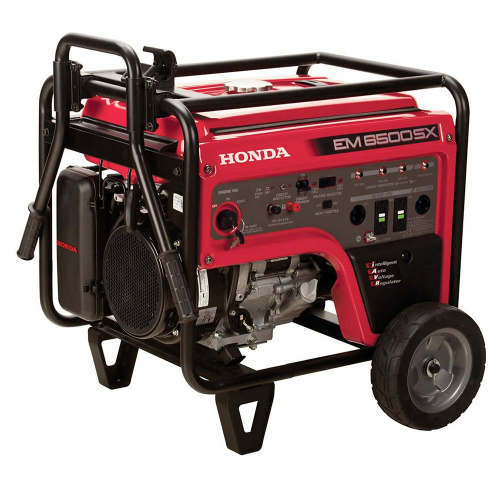 Whether it is at the workplace, campground, running a tailgating party, or powering your house and the essential electronics in case of a power outage or disaster, the generator will always rise to the occasion. Other than being a feature-rich unit, it comes with a low-noise design that won’t disturb the peace of the neighbourhood. For those out shopping for a suitable, versatile and high-performance portable generate, we’d recommend putting the DuroMax XP4400E at the top of your list. From the outside, the Westinghouse WH7500E is no different from other portable generators on the market. It has almost similar dimensions in size, is equipped with two wheels and two handles at the top for moving it about, and has a modest control center. That’s until you scratch the surface or look under the hood, if you will, that you begin to unravel why it is such a hit with outdoor enthusiasts, homeowners, and contractors. 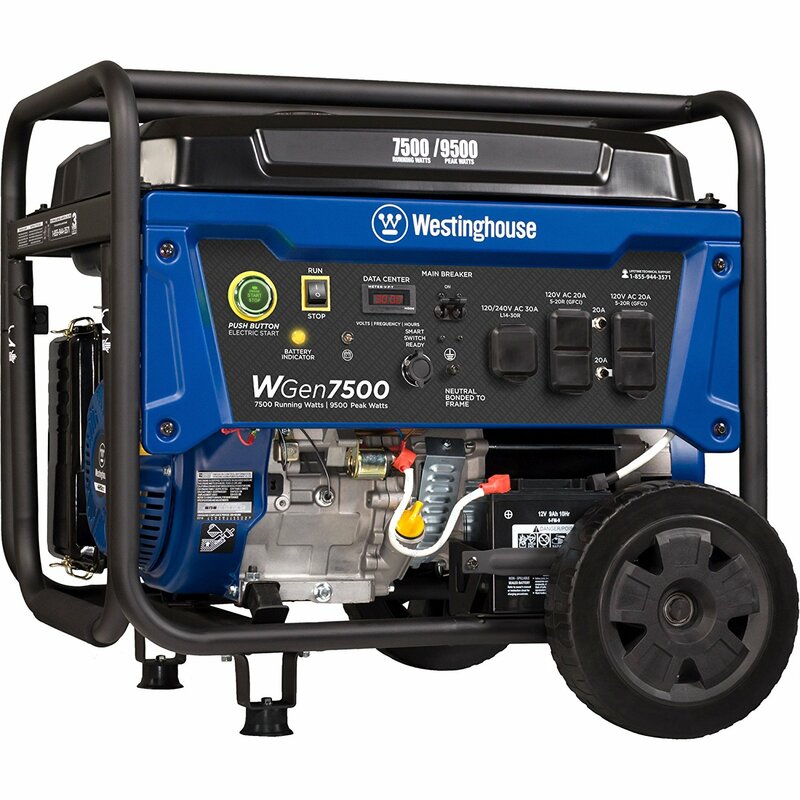 When it comes to disaster and emergency preparedness and the need for extra power and light for a good time at the campsite, tailgate party, or as an alternative source of power when there is a power outage, the Westinghouse WH7500E Gas Powered Portable Generator really shines, both in performance and versatility. Concerning performance, the 4-stroke, gas-powered Westinghouse WH7500E spots a high-performance 420cc overhead valve engine that offers you two starting options: you can either use the electric or manual method, depending on the circumstances. The latter method is usually the last resort for when the electrical method fails and comes handy when there is an urgent need for emergency power. It has a power rating of 7500-watts and a corresponding 9000-watt power surge rating. The power rating of 7500-watts means you have more than sufficient power to smoothly and comfortably operate common electric household appliances for several hours before the restoration of power. With its 5 power outlets and two 120V push-button circuit breakers, contractors, homeowners and those using heavy-duty power tools don’t have to worry about their tools being underpowered as the unit is one of the most powerful portable generators on the market. To recap, for those looking for excellence and dependability in performance, the ideal portable generator for you is this option. It has a useful low-oil shutoff that prevents permanent damage and is similarly equipped with comfort grip manual recoil handle to ensure ease of use. The only drawbacks of the machine are that it's not CARB compliant and it's not as professionally and robustly built to match its premium asking price. Apart from these drawbacks, it works powerfully and efficiently and will prove to be an indispensable addition to any house or workplace. The Westinghouse WH7500E is a user-friendly portable generator constructed to give you peace of mind while enabling you to carry on with your day-to-day activities with minimal interruptions. Like is the case with the previous unit, this machine also comes with an oversized muffler to keep noise levels to a comfortable minimum so as not to interfere with your neighbour's or fellow campers' peace, especially in the quiet of the night. It doesn't produce any chugging noises or excessive vibrations to put a damper on your tailgating party. To allow you a quick, hassle-free start, it offers you a choice of two starting options: an electric ignition and the recoil start. The unit effortlessly chugs to life by just pressing the start button, and all the essential touch points are color coded for easy identification particularly in conditions where the lighting conditions are less than ideal. 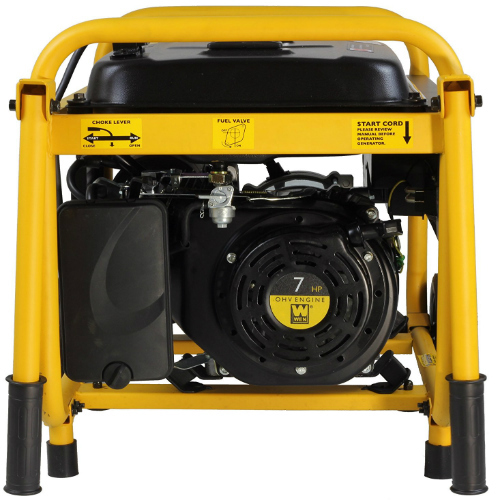 And you don't have to be bothered by portability, seeing as it has a considerably heavy weight of 201 pounds, as the Westinghouse WH7500E Gas Powered Portable Generator has ergonomically designed handles for comfort and sturdy wheels for easily and quickly moving it on different terrains. The operationally-challenged are guaranteed to immediately fall in love with the Westinghouse WH7500E considering how easy it is to use and operate. Aside from the easy start, you have a well-placed LCD monitor for conveniently keeping track of several settings. The hour meter, for instance, is for tracking the duration over which the machine has been operational, oil levels and maintenance schedules. Most importantly though, the LCD monitor tracks the amount of remaining gasoline in the tank, so there is no sudden power interruption. The feature increases convenience by eliminating the need to continuously open the tank to inspect the gasoline status physically. Everything you need to efficiently and smoothly run the generator out of the box comes with the package. You have at your disposal the portable generator itself, flat tires, handle kit, tool kit for emergency repairs, oil, and the associated funnel. Plus, there is an instructions manual with detailed instructions to walk you through all the steps and the English is clear and easy to understand: no point consulting your dictionary. While the 6.6-gallon tank capacity of the portable generator is admittedly small, it nonetheless compensates for the drawback by offering an unprecedented fuel and oil efficiency since it has cast iron cylinder sleeves. You’ll be able to run it at 50 percent capacity for at least 13 hours before the need arises to top up both the oil and fuel levels. One of the best-selling points of the Westinghouse WH7500E, though, is the fact that it is all-weatherproof. The complete and secure enclosure of all the electrical connections means the delicate internal components are protected from damaging agents like water and snow. Their full enclosure also means extreme weather conditions won’t have the slightest impact on their performance so that the likelihood of your engine developing cold feet are significantly minimized. The steel body also does its part in making the unit impact resistant. 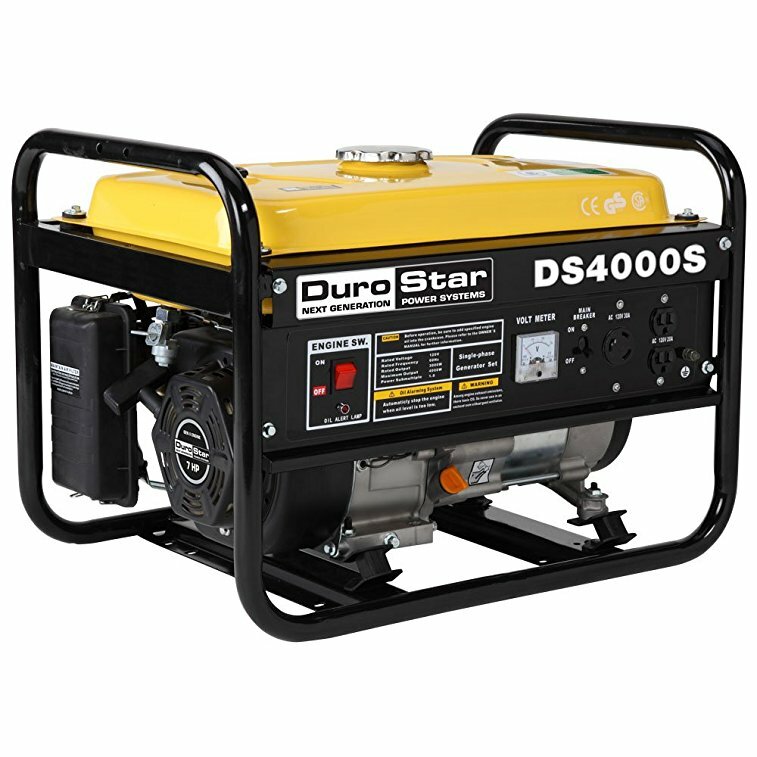 The Durostar DS4000S is yet another practical yet functional gas-powered portable generator worth taking a looking at for those looking for a secondary source of power. Contrary to expectations, its performance meets those of other top-of-the-line portable generators and far exceeds some of them. It can continuously provide you with 3300-watts of power. Boasting a surge power rating of 4000-watts, the machine is equipped with a fuel tank capacity of 4 gallons, enough to power the majority of electrical appliances owned by an average American home or operate some of the commonly used contractor tools like saws and drills. While 4-gallon tank capacity is small, the fuel efficiency of the DuroStar DS4000S ensures you won't have to refill your tank every now and then. It is fitted with three power outlets, the industry-standard 2 120V 20A NEMA 5-20R outlets for powering domestic electric appliances and 1 120 30A NEMA L5-30 for the high-powered electric tools that require more power. As such, the portable generator is an indispensable tool for outdoor enthusiasts who frequently camp out in the dark, contractor who needs to power extra power tools and adequately light up their workplace, and for hosting tailgate parties. As for families, the DuroStar DS4000S is a godsend as it goes a long way in keeping several essential appliances like refrigerators running in case of a power outage. No matter how the outage lasts, you'll have a peace of mind knowing that with a full tank and operating at 50 percent load, the unit comes with a useful 4-point entirely isolated motor mount that ensures a quiet operation by significantly reducing noise levels. Lightweight and compact are the other two words you can authoritatively use to describe its physical characteristics. With dimensions of 23-inches by 18-inches by 17.5-inches, it is by far one of the most compact units on the market and will take up just a fraction of the storage space in your garage. Transporting it from a point A to a point B is made easy by the fact that it weighs just 92 pounds, meaning that the likelihood of it straining your hand muscles, or throwing your back out or developing blistering from frequently moving it around are at a bare minimum. To further make it portable, the unit is equipped with two ergonomically designed handles for carrying it around even though compared to other portable generators, it conspicuously lacks any base wheels. The other advantage to going with this generator is that it features a sturdy and rugged construction of the frame using industrial-grade steel. Consequently, its capable of withstanding heavy use be it on some of the busiest work site or campgrounds or just at home. Other than protecting the delicate internal components, the heavy-duty steel frame also increases longevity as it is resistant to high impact. The other equally important feature for increasing its lifespan is the automatic low-oil shutoff feature that conveniently prevents the machine from starting, so it doesn't permanently damage its internal components. Also, there is a built-in spark arrestor for guarding against the possibility of overload. Bring all these features together and you have a wonderful product that meant to last for more than a lifetime. You also enjoy a 12-month limited warranty to cater for the repair or replacement of defective parts. Other worthwhile inclusions are the easy-to-read gauge that helps you monitor the amount of fuel remaining. Setting up the machine is simplified, so it does not pose any challenges to the most technically-inclined among us and so that you don't incur any additional charges seeking the services of a professional. As for getting the machine running, all you have to do is use the recoil start. The modest and simple design plus the placement of its dials and buttons to allow you quick and easy reach are some of the factors that make it hugely appealing to most people and why it comes highly recommended. The DuroStar DS4000S has drawbacks of its own. First, it is not CARB compliant which basically means all California residents can’t use it. Secondly, as already mentioned, the product lacks base wheels which greatly hinders portability, forcing people to drag it on the ground. Third, there is no wattage meter and replacing the oil requires some practice and patience as you will have to remove the oil drain. In all, this is a perfect choice for people in need of an emergency portable generator that produces less noise and is lightweight and compact for easy transportation. While the fuel tank capacity is a little small, the exceptional performance of the unit completely overshadows this. With a continuous running time of 8 hours and a steady supply of 3300-watts of power, the DuroStar DS4000S is without a doubt a good investment. For people hell-bent on settling for nothing but the absolute best, the Yamaha EF1000iS Gas Powered Portable Inverter is at your service. The unit is gas-powered, as the name makes obvious, and uses a high-performance inverter system that helps to deliver top-quality clean electricity, meaning that it is a perfect choice for running your most delicate domestic and commercial electrical appliances confidently knowing that it won't cause any damage to your power tools and appliances. As for portability, you'll have the easiest time moving or transporting the Yamaha EF1000iS from one location to the next, thanks to the lightweight and compact design of the unit. The portable generator weighs approximately 28 pounds and comes equipped with an easy-to-grip handle for carrying or storing it effortlessly, no matter how demanding the terrain is. The remarkable fuel efficiency and performance is one of its keynote features and one that largely accounts for its rave reviews among homeowners, outdoor enthusiasts, and contractors on such customer-trusted sites such as Amazon.com. Setting the machine on "Economy" mode, for instance, ensures it runs continuously for up to 12 hours before you have to refill the fuel tank. Twelve hours is a sufficiently long time for homeowners to keep their vital appliances running before electricity comes back and for tailgate partying or for camping out in the wild before its daylight. Another game-changing feature offered is the "Smart Throttle Load" feature. With the feature, the portable generator is capable of dynamically adjusting the speed of its engine to match the level of output or demand for power, consequently resulting in the efficient use of fuel. Furthermore, the unit comes with an alternator stator for lowering the speed of the engine and significantly minimizes general fuel consumption. Despite being a feature-rich portable generator, using it won’t be challenging at all to individuals who are not technologically-inclined. For one, the control panel is modest, and all the buttons and dials are neatly arranged, plus, they are sufficiently large you don't have to struggle to use any of them. Secondly, the central placement of the control panel has been done thoughtfully to give you easy and quick reach to all the controls, just in case of an emergency. The owners of automobiles, RVs, and boats will be enamored by the Yamaha EF1000iS on learning that they can use the unit's 12-volt DC output for recharging the 12-volt batteries used by these machines. The fact that it is CARB Compliant should be enough evidence of its smooth and quiet running, even in the middle of the night when it's dead quiet. The product uses noise-absorbing glass wool for dampening the level of the noise, particularly when it is connected to high-powered tools. Additionally, there is a super-quiet muffler that does a tremendous job keeping overall noise levels to a bare minimum. With these features, there is zero chance of attracting the wrath of your neighbours or campers for interfering with their peace. In conclusion, while the Yamaha EF1000iS does not have enough power for powering the whole house, it is nonetheless powerful enough to take care of modest requirements efficiently. It operates quietly and efficiently for up to 12 good hours with the "Economy" mode activated, in which case it boasts a power surge rating of 1000-watts and 900 running watts. It has a 24-month warranty to cater for the out-of-pocket repair or replacement of defects resulting from the manufacturer’s use of substandard materials or poor construction quality. Ease of use is underscored by the product’s lightweight and compact design, comfortable handles, centrally placed control panel, and mufflers to keeping noise levels down. 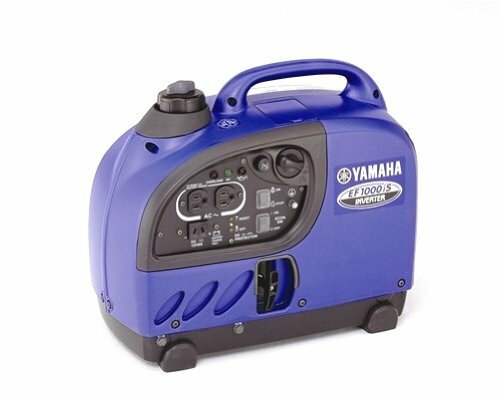 For people who want short of perfection, the Yamaha EF1000iS Gas Powered Portable Inverter is just the product for you. While the WEN 56200i Super generator is a versatile tool and can be used for a wide range of activities requiring an emergency power supply, it is nonetheless optimized to be used for camping. To give you an efficient, trouble-free, and smooth performance in that regard, it has to meet the specific requirement to give you and your fellow campers the best experience one can have. To this end, the most essential feature the WEN 56200i offers you is exceptional portability given that it comes in a compact and lightweight design that will only take up a small fraction of the storage space in the trunk of your car, leaving most of it for bags, tents and such like. With a paltry weight of just 48 pounds, you or the weaker members of your entourage don't risk throwing their back out or straining their hands or suffering fatigue from carrying the unit over a small distance. Regarding performance, the portable generator is equipped with a 79.7cc, 4-stroke OHV engine that operates quietly and uses fuel economically for longer running time. The engine can supply you and your companions with a surge power output of 2000-watts with the running capacity standing at an impressive 1600-watts. As already mentioned, it is meant for use in the wild and for powering high-powered electric appliances like refrigerators in the case of a power outage. For camping and other outdoor expeditions though, the unit will provide with an abundance and uninterrupted supply of clean power at not more than 1.2 percent total harmonic distortion. The implication here is that you can smoothly and confidently run some of the most sensitive electronic appliances without fear of damage. Another innovative and distinct feature is its parallel connectivity meaning that its possible to pair it with other WEN generators that have parallel ports. Consequently, if you have higher power requirements, you can bring two these portable generators on your camping trip, connect them using the optional parallel connection kit and have enough power to power some of the high-powered devices. 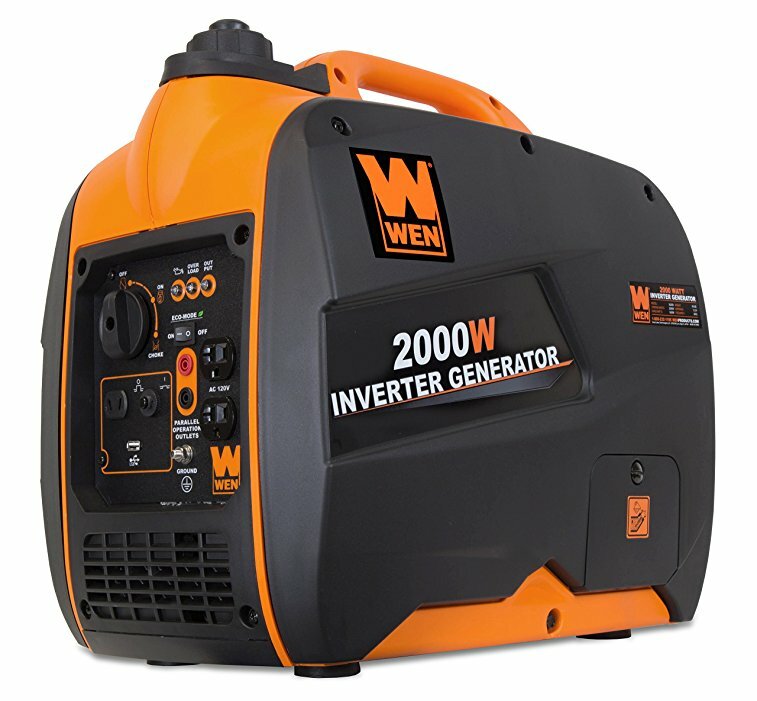 It is such versatility that makes the WEN 56200i Super Quiet 2000-Watt Portable Inverter Generator one of the best portable generators in its class. With additional power at your disposal and four power outlets, you're headed for the best times of your life. The unit spots 2 120V regular plug outlets, one 12V receptacle and one 5V USB port for powering small electronic appliances like mobile phones and tablets. To ensure safety and convenience, the WEN 56200i Super Quiet 2000-Watt Portable Inverter Generator comes with a safety cut-off in case of overloading, and for when the oil and fuel levels drop below a pre-set minimum. The efficient use of fuel is also a huge plus for a product specifically designed for camping expeditions. Because you can only carry so much fuel to the campground, you want to invest in a portable generator that efficiently and effectively uses every drop to light up your world. The Eco Mode, for instance, makes it operate at low revs when the demand for power is low, consequently reducing fuel usage and minimizing levels of noise to a comfortable level. With just one gallon of fuel and operating at half capacity, you'll have a running time of up to 6 hours. Because manufacturers tend to use the phrase "up to" a little optimistically, expect to have between four and five hours of continuous use. As for comfort, the WEN 56200i comes in a quiet design that minimizes the level of noise it makes. Consequently, so you have to worry about upsetting the peace and quiet of your fellow campers and in the process attract the attention of law enforcement authorities and to give you a peace of mind all during the outdoor expedition. A low portable generator with low noise levels is significant because it eliminates the risk of disturbing the quiet peace of nature and ensures you and other outdoor enthusiasts have a pleasant experience. At 51 decibels, the unit is as quiet two people having a conversation in hushed tones. A vast majority of portable generators are plagued by the incessant problem of distortions and fluctuations in power supply, and these fluctuations can cause permanent damage to the delicate internal components of your portable generator. Consequently, our heavy reliance on electronic equipment, some of which are quite expensive and vital for human survival, calls for the use of a unit with clean power. To prevent the possible damage to your appliances and equipment, the WEN 56200i is equipped with a convenient and useful low harmonic distortion, guaranteeing that your delicate electronic appliances are safeguarded against fluctuations in voltage. To recap, this option offers you a comprehensive list of premium features at a fraction of the price of other portable generators. If your heart is set on nothing less than high-performance, reliability, fuel efficiency, portability, and durability, consider going with this unit. It is quite a steal, considering everything it offers. Coming from one of the most highly reputed brands in the industry whose products have become synonymous with high-quality construction and off-the-charts performance is the Champion Power Equipment 73536i. The professional construction using industrial-grade materials and the enclosure of the internal components in a heavy-duty, weatherproof and impact resistant frame means it is capable of withstanding heavy use without its performance suffering even slightly. Consequently, you can use the unit is numerous settings that include the campground, for tailgate partying, for powering high-powered construction tools, and running the refrigerator and other domestic electronic appliances for at least 9.5 hours in case of a power outage. With the Smart Economy Mode activated, you get to experience a considerable reduction in electric load which in turn translates to a quieter operation, longer engine life, and superior fuel economy. You can also use it in different adverse weather conditions like in a place where the temperatures are either extremely cold or very hot and in both cases, its performance remains marvellous. To finish with the overview, this is a lightweight and compact product that operates quietly and efficiently uses fuel to give you a longer run time and most importantly allows for parallel connectivity with another Champion 73536i portable generator. To provide you with the clean electricity of less than 3 percent THD, the unit comes with three outlets: 2 120V 20A household outlets and one 12V DC outlet. For a generator to meet the portability criteria, it has to be lightweight and compact so that an average adult, irrespective of their age or upper body strength, does not strain trying to move it from one location to another. Similarly, the handles, if it has any, should be ergonomically designed to increase comfort and increase traction to minimize any chances of the unit slipping away from the hand. Also, it would be a lot better if it had wheels for greater portability over different terrains. Of these criteria, the Champion Power Equipment 73536i meets a handful. The product is indeed lightweight and compact, boasting a mere weight of 48 pounds, so it doesn't take up too much storage space in the trunk of your car or the garage. However, it lacks wheels and this might compromise portability. Compared to conventional generators, it runs smoothly and quietly in the background, never disturbing the peace of nature or upsetting your neighbors of fellow campers with chugging noises in the middle of the night. From 23 feet away, you only get to hear 53 decibels of sound, which makes it a perfect companion for camping, tailgating, or for keeping home essentials running. One of the most effective ways of testing the noise level generated by a running generator is holding a conversation close to it, and if you don't have to raise your voices to hear each other then it passes the quiet test. The generator is one among a handful of portable generators that seamlessly pass this test. The fuel efficiency of yet another keynote feature. The engineers cleverly took advantage of the technologically-advanced microprocessors and used it to control the smart throttle. The smart throttle works by adjusting the speed of the engine in response to the demand put on it, allowing it to reduce the speed and therefore increase fuel efficiency when demand is low. It is also possible to double the running power output beyond 1.6 kW by stacking up two units with one on top of the other. The design and engineering of the Champion Power Equipment 73536i make the stacking possible, and this explains why it lacks wheels and has squarely attributes – to save on storage space. All you require to make the connection a success are two compatible Champion Inverter Generators and one parallel connecting kit, and you are set to begin making the necessary connections. 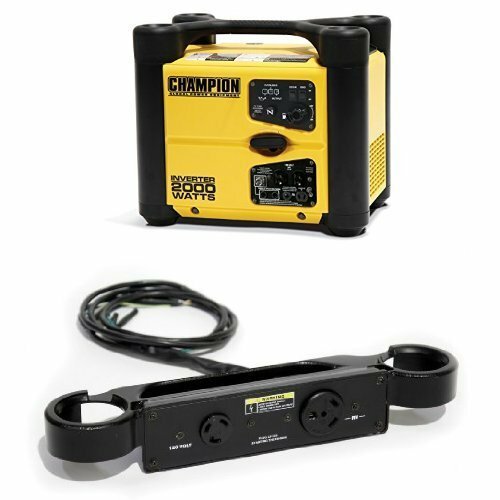 To recap, the Champion Power Equipment 73536i is a lightweight and compact unit that will fit with relative ease into the smallest spaces and won't pose any problems with portability considering it weighs a mere 52 pounds. The product's clever designs allow you to stack two on top of each other to for more power. The unit operates quietly and has an Economy mode that uses fuel efficiently for longer running time. 2000 working watts is more than enough for tailgating, camping, running some power tools, and keep essential home appliances running in case of a power outage. For an uninterrupted supply of clean power for campers and adventures, the Champion Power Equipment 73536i Portable Inverter Generator is more than an ideal choice. 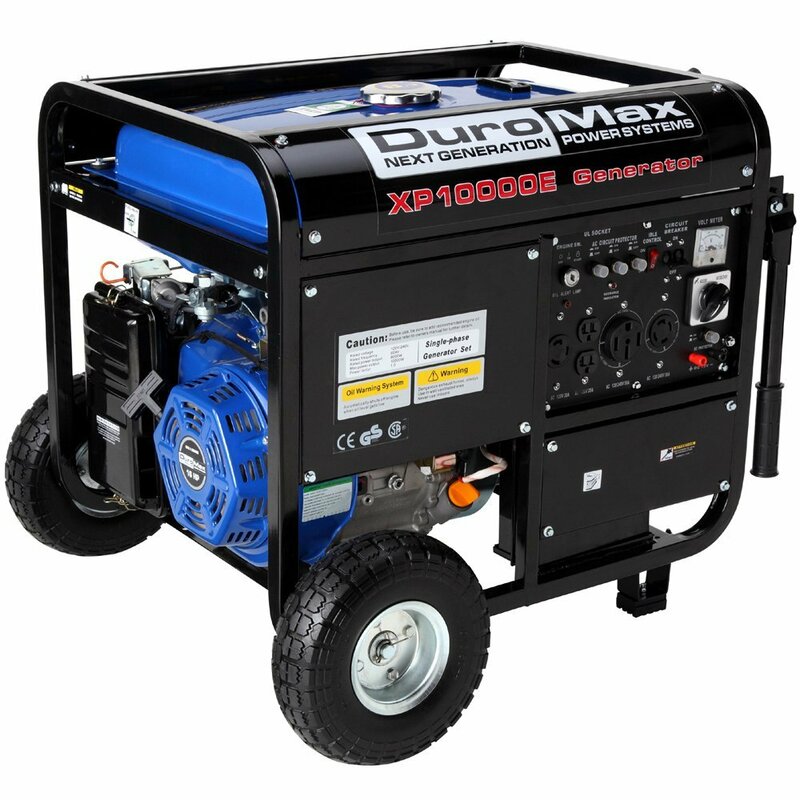 If you’re looking for a versatile, long-lasting and high-performance portable generator, look no further than the DuroMax XP10000E. As the name suggests, the machine is capable of generating an astounding 10,000-watts of power using its 18-horsepower, dual fuel powered engine, more than enough to run frequently used electronic appliances around the house and common construction power tools on the construction site. Outside of these settings, you can also use it for tailgating, camping, fishing, among other uses, meaning that it is just as versatile as other portable generators on this list. In spite of its deceptively diminutive stature, the machine packs an incredible amount of power, has several convenience features, and comes with an easy-to-use fully-loaded control panel boasting six power outlets for greater versatility. There are two 120V, three-prong power outlets for powering essential house electronics, one 120V, a 120V/240V twist-lock ideal for operating the RV, another 120/240V for powering several high-powered electronics like tools and lastly a 12V for charging mobile devices like phones and tablets. As you would expect for a portable generator of its class, the DuroMax XP10000E is equipped with an overload protection for keeping your sensitive electronics safe from fluctuations and surges in voltage. The 33-amp circuit breaker does a tremendous job regulating the flow of current between the portable generator and your connected appliances ensuring that they are not permanently damaged by high current. Another useful feature is the volt meter that enables you to manually keep an eye on the output of the generator, and even though it might lack the effectiveness of the 33-amp circuit breaker, it nonetheless helps protect your products. Starting the portable generator is made easy with the thoughtful incorporation of two starting options. First, you have the convenient and time and labour saving electric start for the individuals who want a hassle-free start in no time. The machine also comes with the recoil start for when the first option fails for whatever reason and you need to have power urgently. Provided the unit is in good operational shape, you should be able to get the engine started with just a few strokes. With a maximum fuel tank capacity of 8.3-gallons, you can run it for an impressive 10 hours straight at 50 percent capacity. Such performance proves that indeed the portable generator gives you the best value for money and is one of the best on the market. You can authoritatively use the DuroMax XP10000E in open and social spaces like campgrounds and national parks around the United States and other countries without risking violating any noise regulation laws, thanks to its quiet and smooth operation. The product works even at full capacity without producing any discomforting noises as it is fitted with a super quiet muffler and spark arrestor. It is, therefore, a great companion for having a quiet time and peace of mind out in the wild. Unfortunately for California residents, the generator is not compliant with CARB regulations and standards meaning that it cannot be used within the boundaries of that state. Nevertheless, the unit is EPA approved and will not release any dangerous gases into the atmosphere; it is an environmentally friendly choice. As for portability, it does not perform according to expectations and is not, comparatively, as portable as its counterparts featured on this list. The unit has dimensions of 34-inches by 27-inches by 27-inches, and while it won't take up too much storage space in the trunk of your car or the garage, it nonetheless weighs some 250 pounds. Upon starting it, it supplies you with 10,000-watts of surge power for kick-starting some of the most heavy-powered equipment at your disposal and thereafter outputs 8000-watts of electricity. Additionally, it has low-oil protection and the ability to operate in 120V and 240V modes at the same time. One disadvantage though, is that it is heavy at 250 pounds. To conclude, the DuroMax XP10000E is a high-performance portable generator capable of supplying you with 8000-watts of steady power and 10000-watts of surgical power. It is a versatile tool and with its six power outlets, will enable you to smoothly and confidently run several small and large electrical appliances at the same time. Its wheels and handles significantly enhance portability, making it possible to drag or push around its immense 250 pounds weight. There is a modest and easy to use power panel. If you need a high-powered portable generator capable of withstanding heavy-duty use and is both easy to use and reasonably priced, look no further than this option. The most crucial step towards tackling unforeseen disasters or emergencies is preparing adequately for them. In the case of power outages, or when the need for emergency power arises, one of your best bets for supplying you with clean, uninterrupted power for several hours is a portable generator. The Honda EU2000i comes highly recommended for many reasons, the important of which are versatility, superior performance, durability, and ease of use. It is designed to be lightweight and compact, long-lasting and user-friendly to give you and your loved ones or friends the best experience once whether you intend to go the campground, parks around the country, or keep your home essentials operating smoothly for some hours before power comes back up. The machine operates quietly and produces noise levels of between 53 and 59 decibels. To put this into perspective, a normal human conversation is about 60 decibels. The Honda EU2000i runs efficiently and quietly to provide you with exceptional functionality without overlooking your comfort and has the ability to deal with a wide range of situations with astounding consistency. The design of the unit allows for the smooth flow of power in a manner that prevents fluctuations and distortions that would otherwise cause permanent damage to your electronic appliances and equipment. The Honda EU2000i weighs 46 pounds, which leans more on the lighter side and is consequently effortless to move or transport from one place to another. The lightweight stature minimizes the likelihood of injuring yourself or any other part of your body while moving it about. 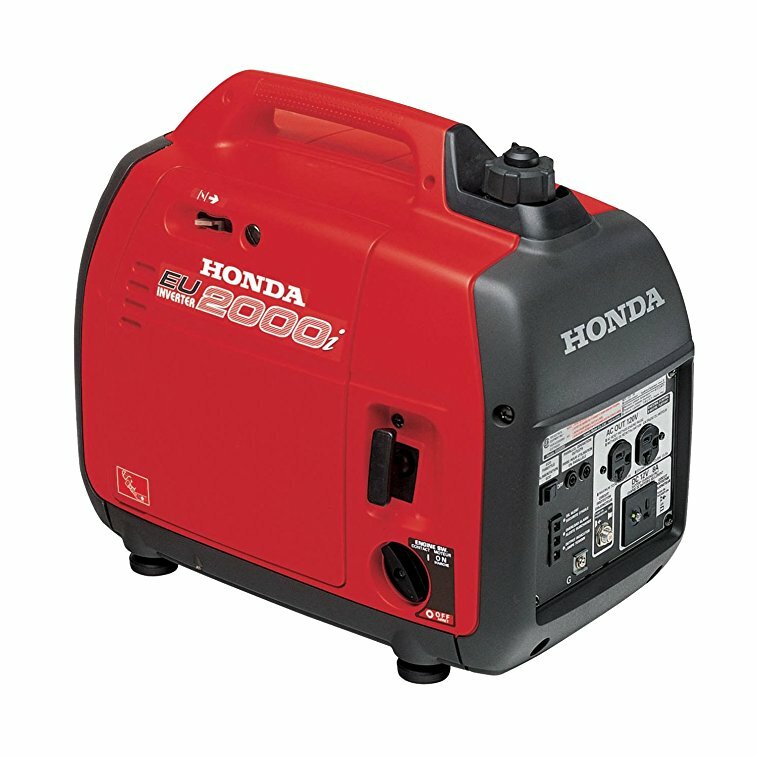 With a full tank capacity of 1.l gallons, the Honda EU2000i Super Portable Generator can run consistently for between 3.4 and 8.1 hours while using regular 87 octane. As these figures indicate, it is by far one of the most efficient units you’ll come across on the market. The engineering allows for the easy servicing of its crucial components like filters and plugs so it invariably in optimal performance condition. It comes with a pull-start mechanism for starting the engine and unlike the case with other portable generators, it doesn't offer any resistance at all. The handle is additionally ergonomically designed to increase your comfort to enable you to carry it relatively easily without straining. Like other portable generators in its class, it comes with an Eco-Throttle feature that automatically adjusts the speed of the engine in response to the load put on it, so it ends up running efficiently. The clean output signal allows you to charge delicate electronics such as tablets and mobile phones confidently knowing there is no likelihood of the occurrence of fluctuations and distortions. For people who want value for their money, the Honda EU2000i would be a very worthy investment. The dependability, efficiency, high-performance, and stability of the portable generators makes it a favorite among outdoor enthusiasts, homeowners preparing for an emergency and contractors in need of a power backup. The unit runs smoothly and seamlessly for between 3.4 and 8.1 hours depending on the load. To sweeten the deal, the Honda brand provides you a sufficiently long 36-month warranty to cater for malfunctions resulting from poor workmanship and use of poor-quality materials. While it is a little on the expensive side, the Honda EU2000i Super Portable Generator is designed to last for more than a lifetime, providing you with exceptional and reliable performance all the way. Your choice of a portable generator should be informed, first and foremost, by your electrical needs. By going around your home with a pen making a quick inventory of your electrical use, you’ll come to the sullen realization that not even the most powerful portable generators are capable of running all your electrical appliances simultaneously. A typical family in the United States, for instance, demands between 10,000 and 20,000 watts of power and the most effective way of meeting this demand is by installing a permanent standby generator, the cost notwithstanding. Here is where portable generators come in. Despite their diminutive sizes, they can keep your home essentials running until power is restored. Most of them can provide about 3,300 operating watts while the surge power rating stands somewhere at 4,000 watts. A majority can run continuously for hours at 50 percent capacity and are therefore ideal for tailgating, fishing, camping, running essential construction appliances and home essentials like the refrigerator. To simultaneously run multiple heavy-duty appliances or equipment, go for a more powerful unit. If you need every drop of gasoline or fuel to count, consider going for an economical portable generator, and there are several of them on our list and the market. The most efficient units are capable of running for extended periods of time at half load without the need to refill the fuel tank every couple of hours. You need to exercise an abundance of caution here because most the times the advertised figures align with the generator running at specified capacities, for instance, 12 hours at half capacity. Rarely do portable generators run at full capacity at the values given by the manufacturer tend to be optimistic. Another important consideration is the consumption of wattage. To ensure a longer lifespan and trouble-free operation for the next several years and for the sake of keeping the unit in optimal condition, there are essential safety features you need to pay attention to. The first, and not necessarily the most important, is the low oil shut off feature that will promptly shut off the engine to prevent it from seizing up in case it runs out of oil. For convenience, other units are equipped with an indicator light helping you to monitor the oil level effortlessly. Secondly, keeping in mind that portable generators are mainly used outdoors, its delicate internal and external components need to be protected from such damaging agents like rain, snow, and extreme temperature. To this end, look out for those units with outlet covers and which are fitted with GFCI outlets, as they will be handy in protecting you and your loved ones from electrocution. By virtue of their names, it would be safe in assuming portable generators are easy to move or transport from one location to another. To guarantee effortless portability, most manufacturers offer units that are both lightweight and compact to allow you to carry it without straining too much and so that it takes up the least storage space. Hardly will you come across a portable generator weighing more than 200 pounds as this would pose tremendous portability challenges. Also, a vast majority are fitted with sturdy wheels to make it easy to push or pull on different types of terrains, especially the rough and uneven terrains characteristic of campgrounds. Some have ergonomically designed handles to provide for easy lifting. These are the features you’ll need to look out for if portability is a priority. Most portable generators incorporate several features aimed at making your work smooth and trouble-free, allowing you to work efficiently and quickly. For those keen on a hassle-free operation, an electric start, for instance, can mean the difference between getting the engine running with the simple push of a button or breaking your arm while pulling on a recoil rope. The fuel gauge allows for convenient monitoring of fuel levels without opening the filler cap while the throttle sensors make timely adjustments to the engine speed to match the load put on it, thereby helping you conserve fuel. All units have multiple power outlets such as a 120V, a DC outlet, a dedicated RV outlet and 120/240V 30A outlets depending on the model you choose. Put together, these features, and so many more make your work incredibly easy by taking guesswork out of the process. Q: What is the difference between rated wattage and surge wattage? A: When you first start a portage generator it produces a peak wattage which lasts a short period, typically between 10 and 20 seconds. While it is useful for jump-starting high-powered tools, it can be harmful to the more delicate small electrical appliances like phones, TVs, and laptops. Rated wattage, also known as running wattage, on the other hand, is the wattage at which the units runs normally and should be the center of your focus when hunting for a suitable portable generator. Q: Do portable generators produce too much noise? A: Different portable generators come with different noise ratings meaning that some will naturally be louder than others. Nevertheless, most of them come with a noise rating of between 55 and 85 decibels. Those producing anything below 75 decibels are classified as sufficiently quiet considering that normal human conversations average 60 decibels. These days, manufacturers put in that extra effort to make their units as quiet as possible so as to be compliant with noise regulations in many countries around the world. In your search for a portable generator for tailgating, camping, operating power tools or running home essentials when there is a power outage, it’s important to understand that no one unit is the absolute best. All products are optimized for use for different circumstances and to find one that best suits you, it’s first critical that you understand your power demands. Portable generators give you a peace of mind as you know you’re set for any power outages or emergencies. Compared to their bolted-down counterparts, portable generators are easy to use, are lightweight and compact for greater portability, and are incredibly efficient, which is why they are the go-to tool for homeowners, contractors, campers, and people who love the outdoors. Our list features some of the best ones that guarantee you value for money and we hope it helps connect you with yours.